Topics: Tender Opportunities, Jobs, Projects, Events, and All Events. 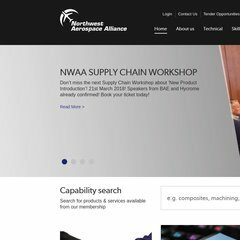 aerospace.co.uk North West Aerospace Alliance Units 9&10 South Preston Office ..
35 users visit the site each day, each viewing 2.10 pages. ns.hosteurope.com, and ns2.hosteurope.com are its DNS Nameservers. Gconnect Netblock (England, Accrington) is the location of the Microsoft-IIS/7 server. The programming language environment is ASP.NET. PING web-101.gconnect.net (84.21.142.135) 56(84) bytes of data.